Terracotta statuette of woman with bird face, ca. 1450–1200 B.C. 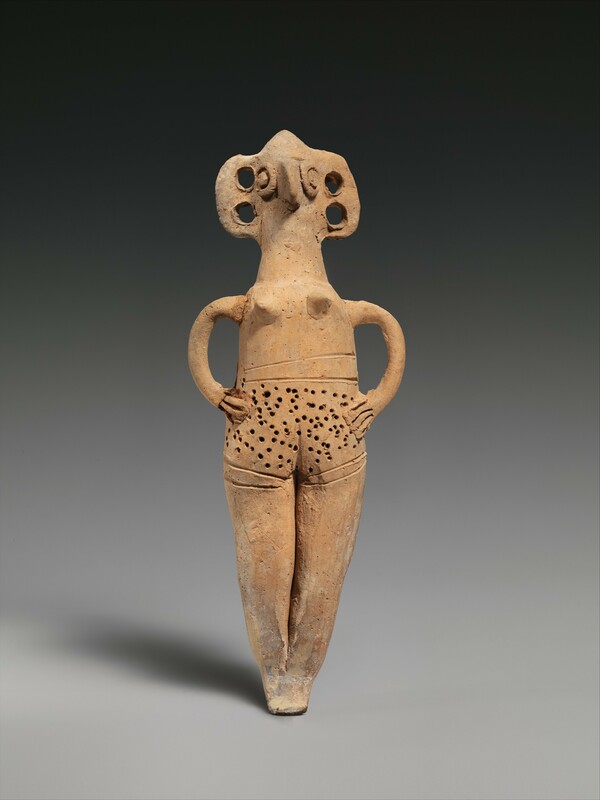 This figurine is typical of Cypriot coroplastic art of the Late Cypriot II and III periods. The type, with the pubic triangle accentuated and the breasts clearly shown, is likely of Syrian origin, but Cypriot sculptors created their own variations. Cesnola, Luigi Palma di. 1894. A Descriptive Atlas of the Cesnola Collection of Cypriote Antiquities in the Metropolitan Museum of Art, New York, Vol. 2. pl. II.10, Boston: James R. Osgood and Company. Metropolitan Museum of Art. 1895. The Terracottas and Pottery of the Cesnola Collection of Cypriote Antiquities in Halls 4 and 15. no. 56, p. 6, New York: The Metropolitan Museum of Art. Myres, John L. 1914. Handbook of the Cesnola Collection of Antiquities from Cyprus. no. 2009, p. 335, New York: The Metropolitan Museum of Art. Karageorghis, Jacqueline. 1977. La grande déesse de Chypre et son culte à travers l'iconographie de l'époque néolithique au VIème s.a.C.. p. 74, Lyon: Maison de l'Orient. Orphanides, Andreas G. 1983. ""Bronze Age Anthropomorphic Figurines in the Cesnola Collection at the Metropolitan Museum of Art." Master's Diss.." Master's Diss. no. 14, p. 16, pl. IX. Karageorghis, Vassos. 1993. The Coroplastic Art of Ancient Cyprus, Vol. 2. no. A(i)12, pp. 4–5, pl. II.5, Nicosia: Foundation Anasatasios G. Leventis. Karageorghis, Vassos, Joan Mertens, and Marice E. Rose. 2000. Ancient Art from Cyprus: The Cesnola Collection in The Metropolitan Museum of Art. no. 14, p. 25, New York: The Metropolitan Museum of Art. Lightfoot, Christopher S. 2000. "The New Cypriot Galleries at The Metropolitan Museum of Art." Minerva, 11(3): p. 21–23, fig. 17. Karageorghis, Vassos. 2002. Early Cyprus: Crossroads of the Mediterranean. pl. 109, Los Angeles, California: J. Paul Getty Museum. Picón, Carlos A. 2007. Art of the Classical World in the Metropolitan Museum of Art: Greece, Cyprus, Etruria, Rome. no. 266, pp. 229, 458, New York: The Metropolitan Museum of Art. Karageorghis, Vassos, Gloria Merker, and Joan R. Mertens. 2016. The Cesnola Collection of Cypriot Art : Terracottas. no. 10, pp. 21, 252, Online Publication, [CD-Rom 2004], New York: The Metropolitan Museum of Art. The Eastern Mediterranean, 2000-1000 B.C. Artist: Date: ca. 1450–1200 B.C. Artist: Date: ca. 325–300 B.C. Artist: Date: ca. 1600–1050 B.C. Artist: Date: ca. 1900–1600 B.C.